So I know, I just kind of disappeared, again. Yesterday, I spent a few minutes catching up on some emails. After I explained to a friend where I have been the last month, it occurred to me that I should probably let you know I am still alive. Life has definitely not been easy this winter. OK, who am I kidding. The last 27 weeks have been nearly impossible. But God is faithful and I know He is with us and guiding us and He has a point in all He is allowing to come into our life at this time. And how much sweeter will the time be that Henry arrives for all the challenges we get to face now? For time sake I am just going to copy some of my email here to let you know what all is up in my little world. Celebrating my birthday with some of my very favorite people. "I have been quite ill for some time, nearly a month. I suffer from exhaustion so extreme it takes up most of my days supply of energy just to get up make breakfast for myself and the baby before I have to go back to bed. A small cold that passed through in January has taken a severe toll on my asthmatic lungs. Even, though I barely got sick... just a little sore throat, no fever, runny nose or cough like the rest of the family... my lungs just couldn't take it. My oxygen saturation is so low my body is physically drained from one trip down the hallway. I am very frustrated at my complete inability to care for my family or do much of anything. Have you ever been too tired to even hold a book? ...I am on lots of meds and they do seem to be making a breakthrough in opening up my airways... Yesterday, I was able to be up most of the day. When I got tired I laid down on the sofa in the family room where the rest of the family was working and playing. So I do think we are making progress. Allen is trying to keep up with being Mama and Papa to the kids as well as keeping on top of ministry and some serious stuff going on within our church family and be a full time employee with lots of travel. He is a good man and I am so grateful God has given him to me. I feel bad for the kids who are carrying a very heavy load right now. Not that they fuss or complain at all. In fact, this morning Allen was telling me he thinks they find it a blessing to be able to serve me so much. Just the same, it seems like much more than they should have to do. I thank the Lord for their love and diligence and willingness to care for all my duties and take care of me, too. As for Henry, we are still unsure of the status of his heart condition. The doctors can not get the views they need to confirm either way if the hole exists or how severe it is. The Lord has given us complete peace with it either way. However, if it is in His will we would like to know before birth so we can make arrangements...because of the way the heart matures, this condition will not become serious until he is about a month old...He knows best and we truly are not worried..."
And that about sums it up. I did log on a while ago to put updated pictures of Henry and I saw Brianna beat me to it with her birthday post. Such very kind and undeserved words. Thank you for all your beautiful emails and comments wishing me a happy day. 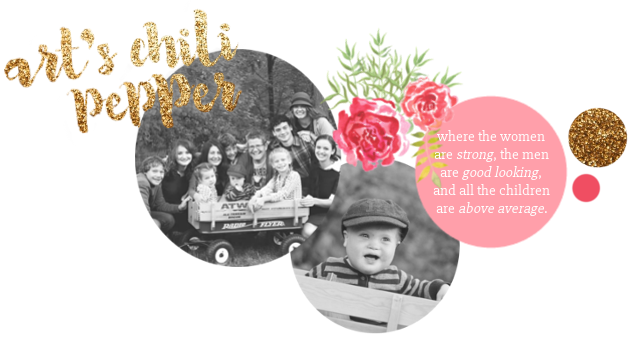 I am so blessed by the friends in blog world and my real life friends who keep in touch through Art's Chili Pepper. And speaking of birthdays... when I wasn't sleeping, I had a good day with the family. The kids cooked some delicious meals and my favorite Hershey Chocolate Cake. As you can see Brianna made over my blog and all the kids again amazed me at their thoughtful gifts. But I have to say, I think Aedan's gift topped them all in the creative and thoughtful department. I am not really too particular about many things. But chocolate, coffee and pencils definitely top my list of things I am a complete snob about. I can't stand a pencil that is too short or one that doesn't have a nice point. My kids know well that when they bring me a pencil in order to qualify it must meet both these requirements. Oh, and I only use American made pencils. I know this sounds a little odd but did you ever notice how foreign made pencils don't sharpen right? The lead keeps breaking and you can never get a good point. So for my birthday Aedan went to Allen and asked him to help with the purchase of a pencil cup with my name on it and a box of American Gold pencils. Isn't that clever? I tell you, this one is going to be an awesome hubby! He even sharpened them all for me and has been known to admonish anyone using one of "Mama's" pencils. I call him the pencil police. In other news... we give the kids turns going with us for appointments. That gives them each a special time with Mama and Pa and an opportunity to see Henry and get to know him. We have always tried to keep our kids involved in our pregnancies in order to make the upcoming baby seem more tangible. It can be hard for little ones to grasp the idea of a whole new person becoming part of the family otherwise. We have found this makes an easy transition when baby arrives and the older siblings always love up on their long awaited brother or sister. We have never had adjustment issues or jealousy problems when a new baby arrives, even though everyone outside of our family always predicts we will. After our appointments kids usually get lunch out or a trip to Starbucks. We let Ellie choose a dessert when we took her to lunch a few weeks ago. I was getting ready to point out some of the treats in the display case but she already had her heart set on this cookie. Incidentally, she didn't eat but one bite, choosing instead to break it into little pieces to share with the other kids. Love this happy face, though. Ellie found these fake roses and made bouquets for all the kids rooms to celebrate Valentine's Day. Work continues in the basement. All our kids have become so handy by helping their Pa with remodeling this house. Even Ellie is learning how to use the electric screwdriver... with Aedan's supervision, of course. Kaitlin made these adorable desserts for the kids on Groundhog's Day. And yours truly... this couch is where I spend much of my time these days. Allen joked about how much school I've taught from this very position. So this has not been our month for appliances! First the espresso machine broke. Then our well pump burned out. Next, was the dishwasher. And more recently the Kitchen aid. Okay and just to prove my point I will add that the pot to the drip coffee maker broke and the carafe to the french press. Do you think God is trying to tell us something there? So one day, while we were waiting for the repairman, the kids ran the dishwasher and discovered that the latch wasn't locking and if they held it closed it ran just fine. Aedan volunteered to secure the door so everyone had less dishes to wash. So this next one isn't a very good picture but I love the idea of it. The kids have been working on clearing things out of the attic to make way for the second floor addition. There are seriously some boxes that we put up there when we moved (in 2001) and never unpacked... because they were mementos or such (think of our wedding programs and stuff like that) which we just don't have any place for. So bit by bit they bring down some boxes and we toss stuff out, donate it or list it on eBay. The girls came across a box of toys from when they were Sam and Ellie's age. Oh, boy! It was so cute listening to them as they dug through the box and reminisced and laughed about their play time as little girls. It was again another reminder of where they have come in what seems like such a short time. My beautiful young ladies are all grown up, and yet, in each of them I see what hides in all of us women somewhere, a little bit of the girl we were and will always be with a little laughter, some frivolity, lots of hopes and a lifetime of dreams. The only difference between being 4 and 41 is that at my age I've seen God fulfill my dreams of love and romance and a prince to carry me away while my sweet daughters still anticipate what magic the Lord will use to make their dreams become reality. In the absence of nieces and nephews around us, Allen and I love having these kiddos (and their brothers and sister) to dote on. They are special friends to our kids and I always look forward to their hugs and kisses and chirpy hellos. Last week they stayed with us for a day. Unfortunately, I had to spend most of the day in bed, but I understand they all had a lot of fun times. Among one of the activities Kaitlin and Brianna had them make cupcakes for lunch. How cute is this little trio? Ellie was totally in love with my outfit for the SweetHeart Banquet. Lots of purple and silver, what's not to love? Anyway, she could not wait until it was over so she could dress up with my shoes and wrap. The very next day she spent tapping around in silver glitter peek toe shoes with 5 or 6 inch heels. She truly amazes me in her ability to balance on them when her feet barely fill more than the toe. I think her choice of pink dress and leggings worked well, too. I love the way these two follow each other around and play together. I hope they will be like my big girls and be best friends always. Kaitlin made them matching Rapunzel dresses. She finished Ellie's this weekend. Carmella hadn't yet eaten her breakfast and wasn't so keen on sitting for pictures but there you have it. I have a few other things to catch up on but time has run out on this post. Again, I want to thank you all for your prayers and encouragement. Can you believe we have less than 13 weeks until we get to meet this little one? So super looking forward to it!!!! Oh, and did I mention we are still working on the basement?????? Yes, you are right, Bree. That is what family is about. For me, at least, it is easier to remember that on the giving than on the receiving end. ☺ I love what the Gilbreth's say in Cheaper By the Dozen... don't you feel sorry for those piddling little families? LOL. Ok, first of all I MUST have that cake recipe! I am going to have McKenzie make it for my birthday. I have published that recipe before. You can find it here. So glad to be of help in the pencil arena. I will warn you, it can be tough to find American made pencils these days and even tougher to resist the cute decorated kind. But stand strong and you won't be sorry. So funny you remember the Sweet Streets. Yes, lots of little parts. The girls seem to handle little pieces far better than the boys, who seem to scatter them from here to there and back again. Ha. Thanks for your constant prayers and encouragement. It's always good to see your updates...I hope you are feeling better! That cake looks wonderful!! Everyone always loves that cake! Here is the link if you'd like the recipe. It is not for the weak at heart. Only die hard chocolate lovers, with lots of self restraint (or lots of people to feed) should make this cake. After calculating exactly what size piece fits in my carb allowance, I've been known to have a piece with my morning coffee. The last few days, I have had huge improvements and not only am I starting to feel more myself, at least more myself at 7 months pregnant, I am also starting to wean off of medications which is so THRILLING! Thank you for your faithful prayers. Happy belated birthday, Kat. I tend to disappear from blogland quite often, too, which explains how I missed your special day. What a beautiful, delicious looking cake you had! Your children are amazing and your big girls are an inspiration. What an incredible gift from God to have a husband and children to pick up where you leave off and care for you in every possible was as Henry grows and develops in your womb. I have been blessed with an amazing husband as well and I marvel at how God has blessed me beyond what I could ever have dreamt. Our children are each a gift and as I see them grow, develop, and change into the individuals God is making them, I marvel once again. I will be counting down these next 13 weeks with you and your family anticipating better health for you and yet another beautiful gift from God in a newborn. It sure can be hard to both live life and blog it sometimes! I must agree on both accounts... my children continue to amaze me and the cake is incredible, I have posted the recipe before because I always get requests. Here is the link for you. We added chocolate dipped strawberries this time. We've done candied citrus and all kinds of other delightful garnishes. It is something, as you say, each day when I wake up beside my good husband I think how God gave me so much more than I could have even thought to ask for. And how unworthy and undeserving I truly was and will always be. I often wonder WHY He chose to be so gracious, as He was setting the stage for our marriage long before I knew the Lord. No matter the reason I am so grateful and, while I will never attain my goal, strive to be worthy of what He has given me. I am glad to see you, dear friend, and thank you for your uplifting and encouraging words. So sorry to hear you have been having it rough... you and your family will be in our thoughts and prayers- all the best to you and little Henry.